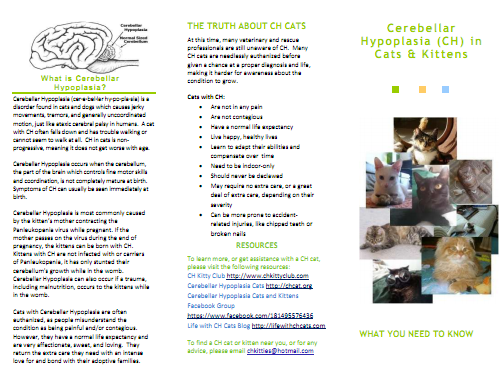 If you’ve been looking for an easy way to spread the word about CH cats, look no further! CH cat parent Elise Murphy did a magnificent job creating two fliers that you can print out and hand out at your local shelters, adoption events, pet shelters, vet offices and more! If you’re not a printing pro, don’t worry! You can always email the links to your friends, family and local shelters. A big thanks to Elise for pulling this all together! ← Can Your CH Cat Manage Stairs? Thanks for the sharing of this information. I’ve had a cat with slight to moderate signs of this disease and have wondered what it was. He seemed a perfectly normal kitten until he and his 2 sisters got an extremely high fever. The vet could not say what caused the fever, but antibotics saved 2 of the 3 kittens (him being one). Since then, he’s had signs of what you’ve explained here as CH. Nice to see people of out there to help these kitties overcome! Thanks again for sharing! I’m glad to hear he and his sibling survived! You may want to watch them closely to see if their signs continue to match up with cerebellar hypoplasia. There are many conditions that have similar characteristics, so you’ll want to make sure. You can find more information here: https://lifewithchcats.com/tag/diagnosis/ I’d also suggest you have them looked at by your vet, which I’m sure is on your list of things to do 🙂 Good luck!